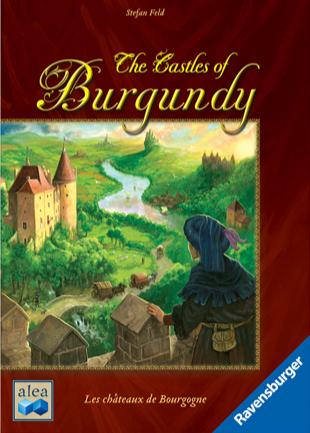 In the Castles of Burgundy, you’re an aristocrat trying to build up your estate more efficiently than your fellow aristocrats. Though the theme is relatively dry, the game uses interesting mechanics and a style of indirect competition that makes it a great couple’s game. The game revolves around collecting tiles for your estate. To begin, arrange the tiles on the main board according to color. 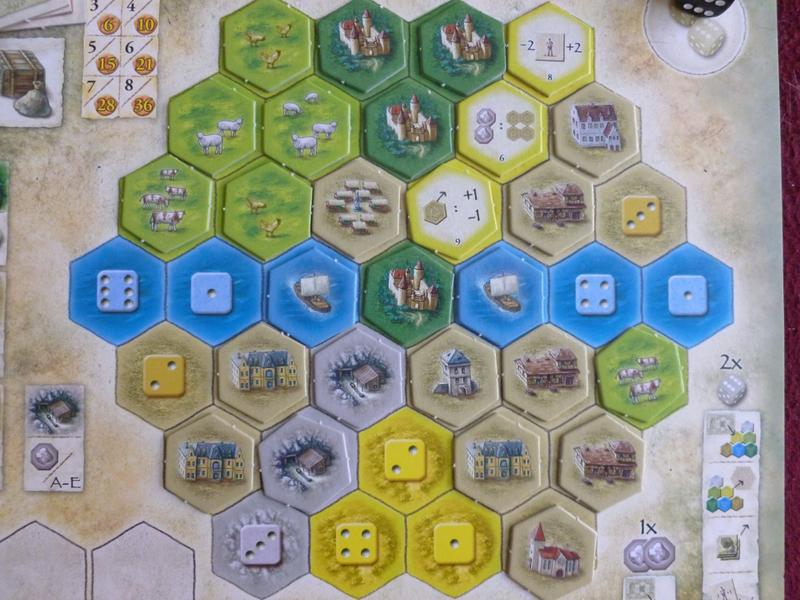 Castles of Burgundy has a very elegant way of adding players (simply adding more tiles to the board), which lets you play essentially the same game with two players as with more players. When setting up the board, be sure to place the correct number of tiles for the amount of players you have. The mine (grey), the ships (blue), and the castle (dark green) will always be the same, but all other tiles are drawn and placed randomly so there will be different tiles to purchase each round. Populate the middle – the black market – by placing random black-backed tiles down (four for a two player game). Randomly place the square goods in their spots at the upper left of the board – five per spot, so that there are five stacks of five goods each. Set up the bonus tiles according to color. These mark how many bonus points a player gets when they complete a color on their board completely. We’ll go over this more later. Also place the scoring tokens in your colors at the 0/100 mark on the track and place the turn order tokens stacked on top of one another on the turn order track, with the last player on the bottom and the first player on the top. 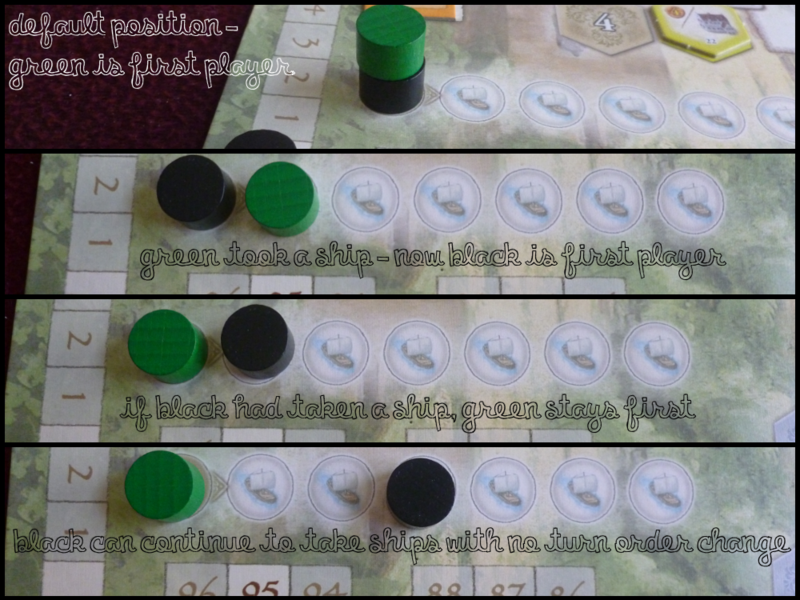 Give each player their own player board (I’d recommend starting with the identical boards for your first few games), one dark green castle (place in the center of the identical boards, or wherever you wish on the others), three random goods tiles to place on their matching squares, two dice in the player color, one silverling (little grey hex tile), and a victory point tile with 100/200 on it. Roll the white die to determine the first player – whoever gets the higher number goes first, and is also in charge of the white die until the turn order changes. The first player also receives one worker square; the second receives two workers, the third receives three, and the fourth receives four. Now you’re ready to go – well, almost! There’s a little more setup, but since you need to do it periodically, I’ll go over it below. Game set up for two players using identical boards. The extra goods are placed aside; they’re used in games with more players. The extra silverlings and workers are the common pool. The game is divided into phases, which are then divided into rounds. To set up each phase, take the first stack of goods from the left and place them into the vertical column below. These are the goods that will be available for pickup each round. To begin each round, have the starter player roll the white die. The number rolled corresponds to the depot that you’ll place the top good into that round. Goods can build up, so sometimes it’s better to wait for a while to grab some goods. You’ll repeat this process at the beginning of each round and phase, replenishing the goods at the beginning of phases and placing them into depots at the beginning of each round. Rolling the five on the white die sends the top good from the column on the left into the number five depot. The die value on the good is ignored in placement; it’s used for deciding if you can sell the good once you own it. Sound confusing? try to bear with me! Basically, phases are larger than rounds. Each phase determines the bonus you get for completing an area on your estate – so in Phase A, you get a 10 point bonus, in Phase B, you only get an 8 point bonus, and so on. Rounds are completed after each player has taken one turn. So for a two player game, it’s after two turns, one for each player. It’s a little complicated, but once you get used to the flow of the game, divvying out goods becomes very automatic. Okay, you’re probably ready to find out what you actually do in this game, hm? At the beginning of each round, roll your two dice. These determine your actions for the round. The numbers rolled determine what tiles you can grab, where you can place them, and what goods you can sell. Let’s break this down a little more. Buy hex tiles. Each hex tile was placed next to a depot with a little die symbol. If you rolled a six, you can only take a hex from the six depot. If you rolled a two, you can only take from the two depot. And so on. Goods (square) are separate from estate tiles (hexagons), so remember that you can only use your die action to take a hex, not a square. 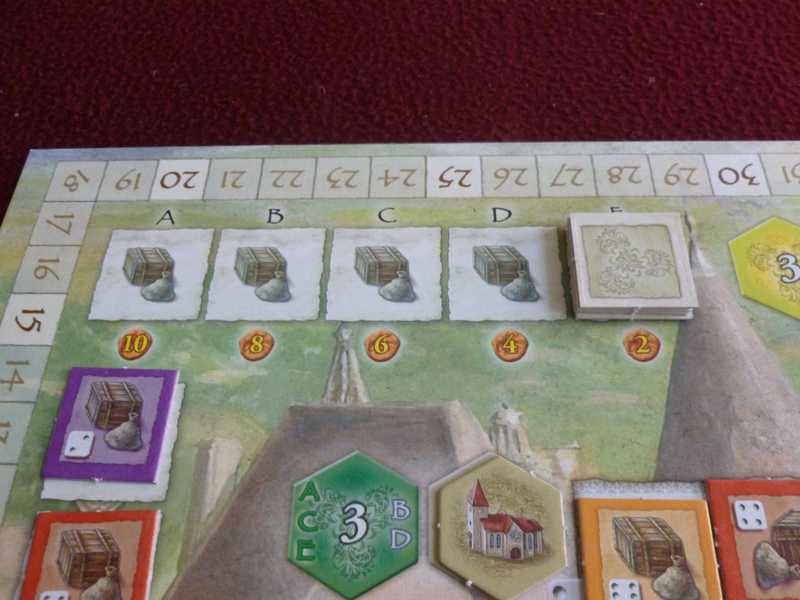 When you take a tile, you add it to your storage at the bottom left of your player board, not directly to your estate. Yellow: “knowledge.” These allow you to modify your rolls, gain extra victory points for certain actions, gain extra victory points at the end, modify how you use ships, or get more silverlings/workers. These are all symbols (and there are a lot, so I won’t go over all of them here), so I’d recommend having the cheat sheet in the rule book next to you for your first few games. Erik and I still have to check on some every now and then when we place a tile we haven’t gotten for a while – or ever! The way the tiles are placed randomly each round means you might not see some for a while. Goods can build up. Depot three or five could be particularly lucrative if you took a ship at this point. You can only hold up to three types (colors) of goods, however, so only take what you can hold! The rest simply gets left behind. Light green: animals! You get victory points immediately when you place animals, equaling the number of animals on the picture (so four cows/chickens/pigs/sheep give you four points). Animals also give you bonus points for any animals of the same species in the same pasture (connected light green area). So if you place four piggies and you already have three piggies in your pasture, you get to count the three again for a total of seven points (plus three from an earlier turn when you first placed the three pigs). Hooray! Dark green: castles. Castles give you an extra action to spend when you place them. An extra action of any die value, that is – so basically you get to do any action for free. Pretty powerful. Grey: mines. These give you one silverling per mine at the end of a phase. Not immediately useful upon playing, but since silverlings can be scarce, it can be valuable. Silverlings are also the only way to buy from the black market (a free “action” not requiring you to use up a die). Beige: buildings. These give you a different effect depending on the building placed. I’ll go over them briefly, but there are icons on your player board that remind you what each do, so you don’t have to memorize these effects if you don’t want. Warehouse: Immediately sell all goods of one color without using up a die’s action. Nets you one silverling and two times as many points as goods you sold. Carpenter’s Workshop: Take any other building for free and place into your storage. Only from the depots, though, so no sneaking from the black market. Church: Take a mine, castle, or yellow knowledge hex for free and place into your storage. Again, not from the black market, but any hexes in the depots are fair game! Market: Same as the above two, but take an animal or ship instead. Boarding House: Take four workers from the supply. Bank: Take 2 silverlings from the supply. City Hall: Add any of your hexes in storage directly to your estate without using up a die’s action. Then immediately do its effect as if you had placed it normally. Watchtower: Immediately score four victory points. Something to remember about buildings is that you can only have one of each type of building per city – that is, connected beige area. If you really want an all market city, however, there is a yellow knowledge tile that allows you to ignore this rule, so hope it gets pulled and you grab it! The player aid is printed on the left of each player board. It serves to remind you what each building and color does. Well, except for the yellows. They’re an eternal mystery. Place hex tiles. Another action you can take is to place a hex. You can only place a hex in a location on your estate that has a matching number to one of the dice you rolled. So if you rolled a two, you can only place a hex on a two segment of your estate. All hexes must connect to at least one other hex, so you can’t place anything way out in the boonies. Sell goods. You can sell all of a single color of goods. You can only sell a good with a matching number to one of the dice you rolled. No matter how many goods you sell, you will always receive one silverling, but you will get two victory points for each good you sell. So, selling two pink goods gets you only one silverling, but four victory points. Take workers. You can take workers on any die roll. You get two workers unless you have a knowledge tile that modifies this. Why do you want workers? Well, workers are awesome! Workers let you modify your dice rolls. One worker can modify a roll by plus or minus one. So, if you rolled a six and a three, you can use your workers to change the six to either a one or a five, or the three to a two or a four. This makes it much easier to get exactly what you want from the depots or to place onto your estate in open spots. You can use multiple workers as well, so you can modify the six to a two or a four by using two workers. You can modify one, both, or none of your dice per turn (provided you have enough workers), and modifying doesn’t use up an action. So be sure you have enough workers to do what you want! Enough workers allows you to mitigate even a terrible dice roll for the situation into something very useful. Every turn, you can also buy from the black market. Each hex tile there costs two silverlings. Buying from the black market does not take up an action, so if you have enough silverlings to buy something (and want to! ), you can essentially do up to three things per turn. More on Scoring – and Winning! Animals, watchtowers, and selling goods score victory points immediately, but all other victory points (VP) come after achieving something larger. The main way of getting lots of VP is by completing regions in your estate. Regions consist of one fully enclosed area of the same color. A region of only one counts, with the largest region being eight spaces, which scores a whopping 36 points! All values are printed on your player board, so you won’t forget how much to score each. The basic boards’ largest regions only go up to five, not eight, but the 15 point bonus for five spaces is still nothing to scoff at. In addition to the points you get for simply completing a region, you get extra VP depending on the phase you completed your region in. Phase A rewards 10 points all the way down to Phase E, the last phase, which rewards only 2 points. This game is currently in Phase D, so the bonus for completing a region is 4 VP. And there’s more! Completing all regions of a specific color first and second gives you bonus VP. So whoever completes all animal pastures on their map gets bonus points. The value depends on the number of players in the game, which are printed on the tokens. In a two player game, you get five bonus points. You get six in a three player game and seven in a four player game. Second place gives you a smaller bonus tile, where the values range from 2-4 VP. If you complete one of these, score this immediately with your other region points and take the token to your player board to designate the bonus isn’t up for grabs anymore. The winner is simply the person with the most VP at the end of the last round of Phase E. But don’t forget to score end game points! Many of the yellow knowledge hexes give you bonuses at the end – though you only get these if the tile is placed in your estate, and not if it’s in your storage. You also get one VP per each unsold good, each silverling in your stash, and every two workers left over. 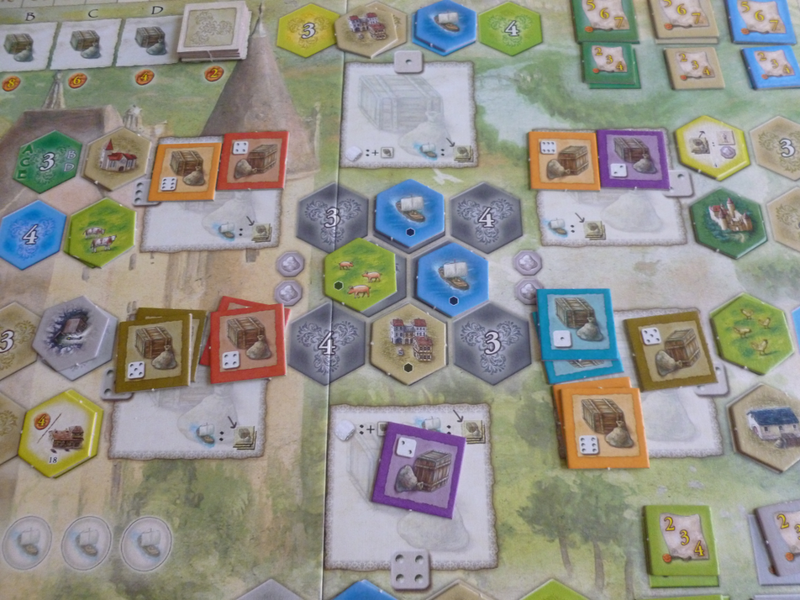 There are many different strategies to pursue in Castles of Burgundy, and I don’t proclaim to know them all. So, here I’ll go over only some of the things I’ve personally found to be effective – Erik would probably have some very different ideas! If you have silverlings, spend them! Unless you’re nearing the end of the game, when silverlings can essentially turn into VP, silverlings can give you a great advantage in buying from the black market and getting an extra useful hex tile to add to your estate. Buying from the black market doesn’t take up an action, so don’t forget to do it – you might be able to pick up one of the items to deny your opponent or to come back from a play they made to deny you. The black market in the center of the board can be very useful. If you’re going for a ship-centered strategy, this particular black market could be very useful for you! Don’t underestimate animals – many of my victories have come from focusing on animals. There is a very synergistic yellow knowledge that gives you bonus VP at the end for having different species of animals in your estate at the end of the game. I believe it gives you up to 16 points if you have all the animals – a crazy good amount that late in the game. Definitely grab that yellow if you’re going for animals – or even to prevent your opponent from getting it. Likewise, don’t be shy about completing one or two space regions. They’re almost worthless in the later phases, but if you complete them in the early phases, you’re looking at up to 10 bonus VP just for completing them early. Ships change the order of turns. Since the first player that goes gets first pickings, it can be extremely valuable to have that first player status. I often won’t take a ship until after Erik places one if I’m going first, just so I can hold onto first player. If, on the other hand, you’re the second player, you can pretty much take ships at will, building up tons of goods, unless you’re hoping the first player will take a ship before you. (This was pointed out to be incorrect! Please disregard the image below, or at least make a mental note that it’s reversed. Turn order goes from right to left, NOT left to right, and top to bottom in a given column or turn order markers) Building up lots of goods can be very useful if you have the knowledge hex that awards bonus VP for each good sold at the end of the game. In that vein, always make sure you know what the yellows on the board mean when you dole them out. Some of them are very powerful, and you might want to beeline for them. On the other hand, some of them are kind of wimpy or just not applicable to what you’re doing, so you know you can safely ignore them. Just don’t forget that sometimes the best play might be to deny your opponent(s) form getting that tile and all the VP it might give them! Hoard, hoard, hoard! If you can’t get much done in the last few rounds of any phase (but especially the last one), hoard workers, silverlings, loot – anything you can get your hands on! These give you extra VP at the end of the game, which might be enough to swing things in your way in a tight match. 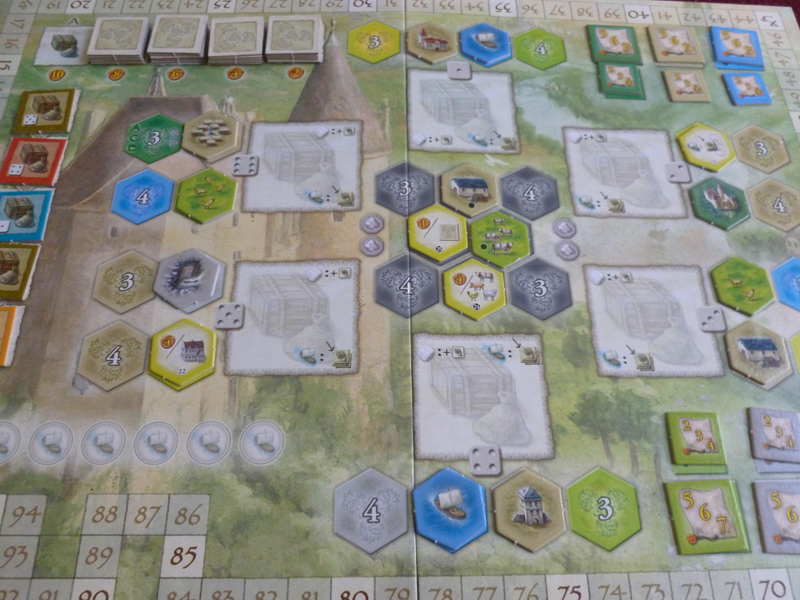 I really enjoy Castles of Burgundy. Unfortunately, we’ve only played it with the two of us, so I can only give my opinions as a couple’s game, but that’s what you’re here for anyway, isn’t it? 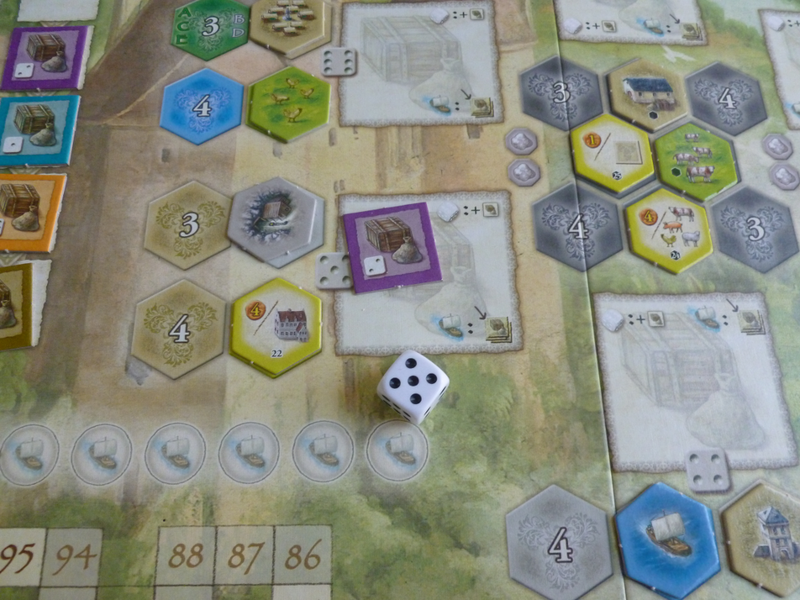 There is luck is Castles of Burgundy, since your actions are almost completely determined by what rolls you happen to get on your dice. BUT – due to the clever worker mechanic, the luck can be partially or even completely mitigated through smart play and management. Often, especially in the early rounds of a phase, there are many valuable actions you can take, so even a roll that may fist appear useless can be workable even without modification. Though you’ll definitely start disliking doubles in this game. Most of the time, you want completely different rolls, and doubles of the same number are a bother for sure. But again, they are hardly ever unworkable. The biggest luck determinant is the roll at the beginning of the game; this determines who the first player is. Since the first player always gets first dibs in the round, it’s a very powerful position. It also isn’t very transferable – since turn order only changes if the first player decides to buy a ship, turn order may never change in the game, which can be a little frustrating as the second player. I feel like there is a good amount of both strategy and tactical thinking. You usually focus on one long-term strategy to focus on (I usually do animals…so predictable) and, throughout the game, you adjust your strategy and come up with different tactics to respond to how your opponent plays. I would be interested in seeing how it plays with more players and if different plays would be more effective. A common tactic for two players is to assess what your opponent is going for and try to deny them if possible, especially if there is a valuable yellow on the board. Since there are more hexes available to buy in three and four players, this may or may not be as valuable a move. I suppose you’ll just have to find out if you’re interested! 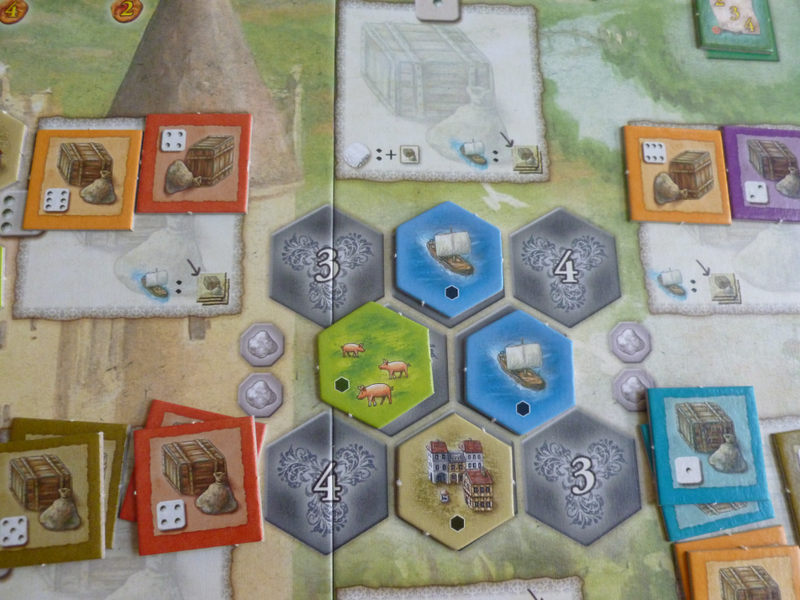 The theme isn’t very strong in Castles of Burgundy, but this isn’t highly uncommon in Eurogames. It’s fun enough to see your “estate” build up before you, and you’ll probably be so busy thinking your moves through and planning that the lack of theme won’t affect you that much. This is the case for me at least, and I like to consider myself a theme connoisseur – much to Erik’s chagrin usually. Although not exceedingly evocative, the board does make you feel like you’re shopping for upgrades to your personal estate. The castle in the background is a subtle addition to help get the theme across as well. The interaction I feel can be variable. On one hand, it isn’t great, as you’re mostly focused on your own estate. On the other, if you choose to, you can spend a great deal of time looking at your opponent’s estate and watching their moves in order to figure out their plans and decide if you can block them. So, for the way Erik and I play, I would actually rate interaction fairly high in that you’re always keeping an eye on your opponent. Every hex you take, additionally, is a hex you’re taking away from your opponent. However, I could also see this game playing very solitaire-style if you play nice and try to avoid conflict; of course, often you might find yourself taking a hex your opponent needs by accident this way, so you either run into conflict or end up watching your opponent’s estate just as much as you would if you’re trying to block them! With the variable player estates included with the game, I feel like there is a good amount of replayability. Each game lasts fairly long and is satisfying, even after multiple plays on the identical player boards. Adding the asymmetrical boards adds another layer that increases the replayability. Erik and I haven’t played all the boards, unfortunately, so I can’t speak to their relative balance, though I know that after I whopped him in our first variable estate game, he wasn’t quite extolling the virtues of his chosen board. 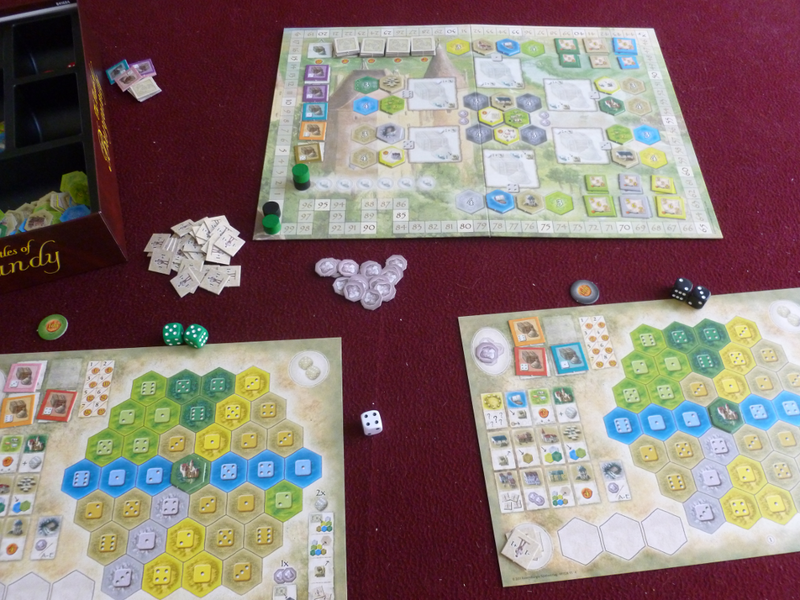 As a fairly long game with some decent set up, fair amount of rules, and a good amount of strategy, I would rate Castles of Burgundy as a fairly heavy game. It’s definitely not one we’ve felt comfortable bringing out in our four player group mainly for the lack of theme and possible analysis paralysis it might induce, so I can only recommend this for certain groups. Having a reliable partner helps as well, as the rules become very automatic when playing a lot, so even an initially reluctant couple could come to enjoy this game, as long as you’re not looking for a filler instead. While not amazing, the player boards are functional and colorful enough, if a little busy. Some of the icons are confusing at first, but I do appreciate that everything is shown in pictures instead of writing on the board – it makes everything look much cleaner than a board that displays a lot of information. The estates themselves also do look pretty cool when you’ve built them up and you can see all your decisions on what to build in front of you. An estate nearing completion. Sadly, no piggies roam this estate. Component Quality: Components are good, with all the tiles and hexes being made of good quality cardboard and a few wood tokens. I like that the black market tokens not only have a black back to differentiate them, but also have a little black hex symbol on the bottom of the tile so it’s very easy to sort them back into the box at the end of the game. The box itself is also pretty good; a few more slots would be nice, but those it does have have nice curved sides so it’s easy to scoop the tiles out. I do wish the player boards were made of a sturdier material though; although the main board is sturdy cardboard, the player boards are all just thick paper. Understandably, it would be difficult to store all the boards, but I do worry they’ll get smushed and folded one day, and that would make me a very sad panda. 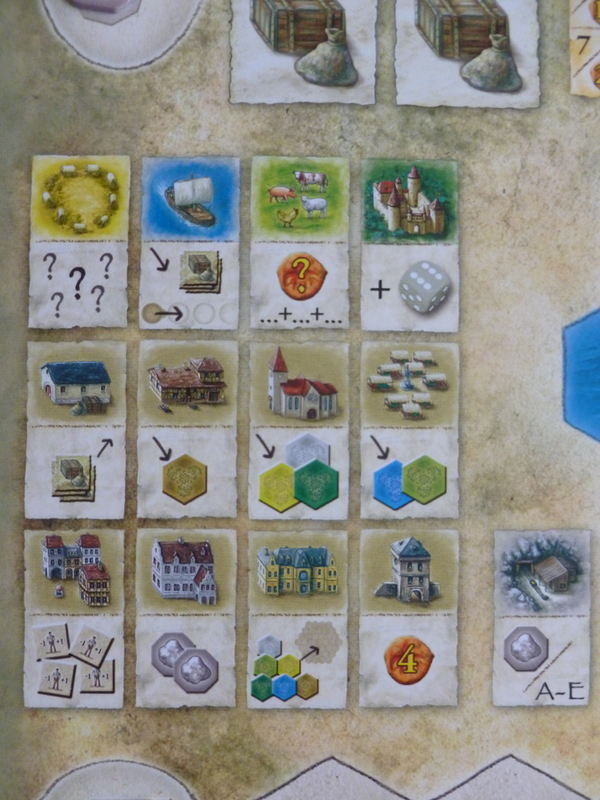 Value: We’ve played a pretty good amount of games of Die Burgen von Burgund (tip: calling it by its German name will make you want to play it even more), and I can see us getting plenty more out of it before even beginning to get tired. The rules are well written, the pieces are nice, and, most of all, it’s an incredibly solid game. I can’t imagine us getting rid of it any time soon, if ever! Overall: The Castles of Burgundy is a favorite of mine in terms of a good, strategic, and not directly confrontational couple’s game. If I’m in the mood to think a good amount (but not have my brain totally burned), I’ll definitely suggest the Burgen. It’s a little tedious to set up and take down, yes, but the gameplay more than makes up for it. I love the luck mitigation and the feeling of building up my estate in a more efficient (i.e. more VP-gaining!) way, and I definitely suggest it for couples looking for something less confrontational but still competitive. Overall, Castles of Burgundy is a solid addition to any couple’s collection. all wrong about turn order. It goes right to left. Farther right goes first. Wow, thanks for that. Haven’t played in a while but took a look at the rulebook and you are correct, we must’ve misread it. Oops! Will edit the article to make sure to note we’re wrong. This game seems to be a hit with so many people and it plays so well with two. I still use the #1 boards since I’ve only played about 5 times. I want to try the various expansion tile sets but they are so expen$ive on ebay. ps: in case you didn’t know, I read online that there is a mistake in the rulebook. The tiebreaker in English and French incorrectly says the winner is the person with the “least empty spaces” but it should be the player with the MOST empty spaces. 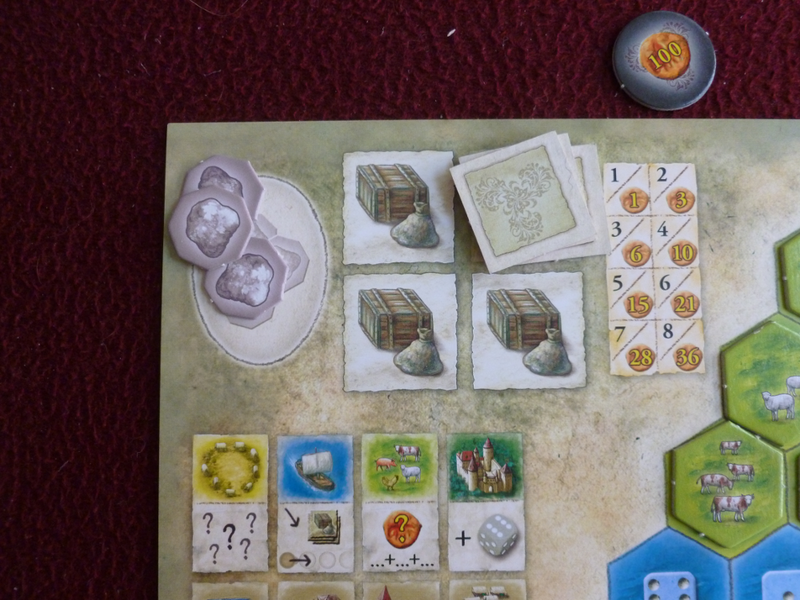 It does play pretty well with two, though I think one of the reasons I haven’t played it in a while is that it can be kind of fiddly with having to set out the goods/land plots every so often and keeping track of the dice and stuff. With new players, changing your board and having them play with the default is a nice touch too, if you want to give yourself a little handicap. Wow, I did not know that about the tiebreakers. It seems like if there were a tie it should go to someone who has filled more of their board in than someone who hasn’t, but good to know, thanks!